Pelican Paradise is something you should read. A rookery in Bennet County. The following article from the 2001 July/August edition of the South Dakota Magazine discusses just one of the many projects that the Civilian Conservation Corps (CCC) either completed or greatly contributed to in the state. Thank You South Dakota Magazine for allowing us to include it in our collection. 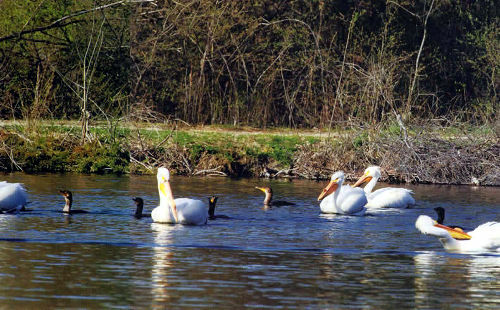 Hardly a pelican was seen in Bennett County when the federal government created the Lacreek National Wildlife Refuge on marshy Lake Creek in 1935. Civilian Conservation Corps workers built dikes and water control structures that eventually resulted in the creation of 11 pools of water. They range in size from 80 to 400 acres. Pool Nine created an island, and by the 1940s, pelicans migrating from Texas chose it as their rookery (nesting place). In West River, place names are usually practical. The refuge on Lake Creek is named Lacreek and the rookery is simply Pelican Island. Rolf Kraft, the refuge manager for 23 years, has grown accustomed to the behaviors of the American White Pelican (Pelecanus Erythrorhynchos). He says they like the island because it provides protection for their young. "Baby pelicans need a lot of protection. The young are totally helpless at birth. They are blind and bare of feathers, so the island provides a buffer from predators like coyotes," he said. The young are hatched without the ability to regulate their body heat. That's a throwback to the birds' distinct relationship to reptiles, explained Kraft. To protect the bare-skinned babies from the June and July sun, pelican parents fan them with their big wings and block the sun with their white feathered bodies. Pool Nine and the other lakes also offer ample food supplies. 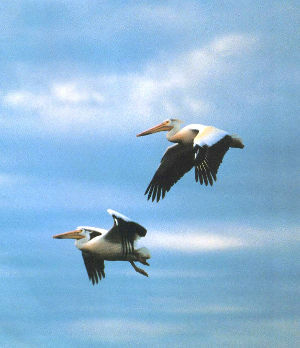 Pelicans dine on carp, mud puppies, salamanders and anything else they can catch. 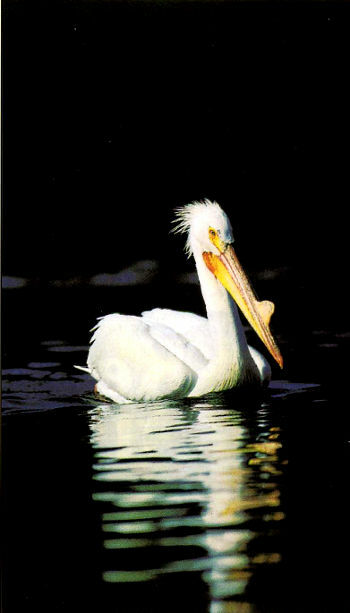 Kraft estimates that the pelican population at Lacreek consumes from seven to eight tons of fish, mostly carp, every day. The birds fish by using their orange pouch as a scoop. Often they work together, pushing fish toward a shore in shallow water or surrounding a school of fish. When the fish attempt to dart through the line, the pelicans dip their heads into the water and scoop them in their bills; then they lift their heads high in the air and swallow their catch. Caution: don't read the rest of this story if you are at the dinner table. Once the fish is digested by the pelican, he or she regurgitates it into the pouch as a fishy soup and the youngsters then help themselves. When a flock regurgitates eight tons a day, a few thousand pounds of fish parts are sure to show up on the ground and in the water. "Pelicans can be a pretty smelly bird," Kraft said. "Sometimes when we band the birds for identification, some of the young workers can hardly stand the smell. They've been know to regurgitate their own lunch." The odor doesn't seem to bother the pelicans. "Fortunately for them, they don't have well-developed olfactory organs," Kraft explained. Although Lacreek's food supply in the 11 pools seems adequate, the birds go on fishing expeditions 50 or 60 miles away once the infants are a few weeks old. They fly in V formation at speeds of 30 to 40 miles per hour, gliding as gracefully as any flock of waterfowl. On land, however, the pelican could only be described as clumsy and ugly. When standing, they sometimes lean on a friend to keep from falling. They take ridiculous kangaroo hops to get in the air. Kraft said they are built for the air, not the ground. "The adults will often have nine-foot wingspreads, which is a good ratio for the 10 pounds they might weigh, so they make a very good sail plane. They find thermals to get lift and gain altitude. You'll see them circle as they rise and then they'll glide down and down. They glide from thermal to thermal so they don't spend a lot of time flapping their wings." Predators don't often bother pelicans on the island. Occasionally a snapping turtle will catch one while it's fishing. 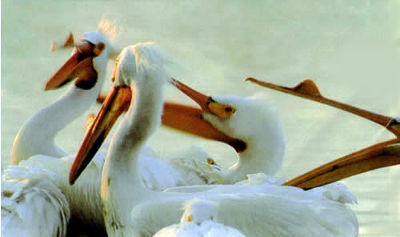 Gulls sometimes attack the helpless pelican infants. But Pelican Island, with its moat of shallow water, keeps most enemies at bay. As many as 10,000 people come to Lacreek every year to see pelicans and other birds, such as eagles, peregrine falcons, whooping cranes, cormorants, hawks, owls, trumpeter swans and osprey. Visitors are welcome during daylight hours throughout the year. The refuge is 13 miles southeast of Martin. Some of the roads to the refuge are impassable during wet weather. Kraft says it isn't difficult to find the bird populations. Walking trails are available, so a pair of comfortable walking shoes is a good idea for the adventurous. A map is available at the refuge headquarters. Roy David Ferris is a photographer from Fremont, Neb. He specializes in wildlife and landscapes. 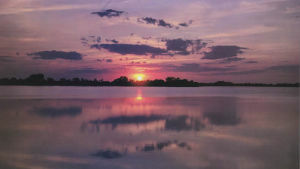 Sand Lake is another National Wildife Refuge that the "CCs" helped to created. 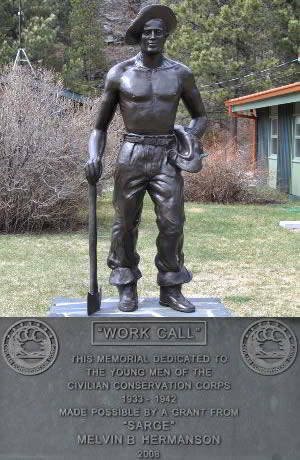 Civilian Conservation Corps workers built dikes and water control structures that eventually resulted in the creation of 11 pools of water.